The four-acre garden surrounding Liberty Hall and the Orlando Brown House is the site of special events, both public and private, throughout the spring, summer, and fall. 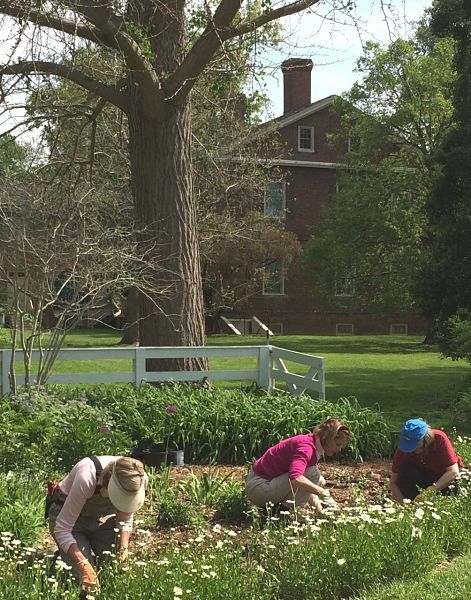 Every spring, usually in early May, the public is invited to help our gardening staff plant the Orlando Brown House and go to work making the Liberty Hall Gardens beautiful! If you are interested in volunteering your time to work in the garden on a regular basis, please visit our Volunteer page to fill out a form and join our team. Each spring, Liberty Hall Historic Site offers cuttings, seedlings, and potted plants taken from the garden. Plants available include: Northern Catalpa, yellow flag, lily of the valley, interrupted ferm, foxglove, vegetables, herbs, asters, and day lilies. These sales help fund the upkeep and improvement of the garden. Dates and times can be found on the Events Calendar. The grounds are available for rental mid-May through mid-October. All sorts of events may be held on the grounds, including wedding ceremonies, receptions, church picnics, celebrations of life, Bar Mitzvahs, corporate events, or non-profit events. Visit the Wedding Info page for more information on the rates and terms.